Boys Rugs will teach your students about the planets and stars! Most children have a fascination with what floats above them in the night sky. They sprawl out in an open field to gaze at the flickering planets and stars overhead. Their wonderment piques their interest in the cosmos, something that you can take advantage of in your classroom. 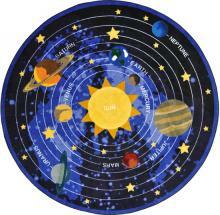 Boy rugs provide the perfect teaching tool for learning about the planets and stars. We highlight each plant in brilliant colors and create an orbit on our comfortable rugs. With this rug, your students will gain valuable knowledge about the solar system, while you provide additional information about what floats around in outer space. After a fun cosmos lesson, your students can take a short nap on our heat insulated Boys Rugs. Our design and construction exceeds the most stringent indoor air quality standards, ensuring your students do not inhale fumes that can harm them. An antimicrobial treatment prevents mold and mildew from growing in places that become saturated. These rugs are available in six sizes, with three coming in round shapes and three coming on oval shapes. The brilliantly designed sun and planets will never fade from your students' view, as we use Colorfast to provide fade resistance.